Bailey Dailies: I'm Loving It! Favorite Game Edition! Today marks less than one week until the first college football game kicks off and 1 week plus 1 day until the first Alabama game. In honor of this momentous occasion, I wanted to share some of my favorite football games with you! This may actually be my favorite game of all time. I woke up that morning and crossed campus at the crack of dawn. People were already setting up their tailgates on the quad, and people were already drinking. Why was I up that early? I was taking the LSAT--in a campus building, while people tailgated all around. I had my bag packed with my game day clothes, shoes, and make up (hello, it's the South--we look our best at games). As soon as the test proctor let us go, I made a bee line for the sorority house to change, eat, and get into the stadium. I knew I had done well on the test so I was in high spirits when I entered the stadium. Florida had a new coach, Urban Meyer, who was supposed to be amazing, and our team was actually half way descent that year. I have to say that I have never heard the fans at Bryant Denny so loud before--it was deafening. The only silent moment came when our star player, Tyrone Prothro, gruesomely broke his leg. Silence is a misstatement, because there were Florida fans gator chomping and cheering as his bone was sticking out of his skin and as he lay writhing in pain on the field. The gators had insulted our player, our team, and our fans, and after that moment, there was no turning back. The crowd got louder, the team hit harder, and we ended the game with a 31-3 victory, even though the Gators were the overwhelming favorite. 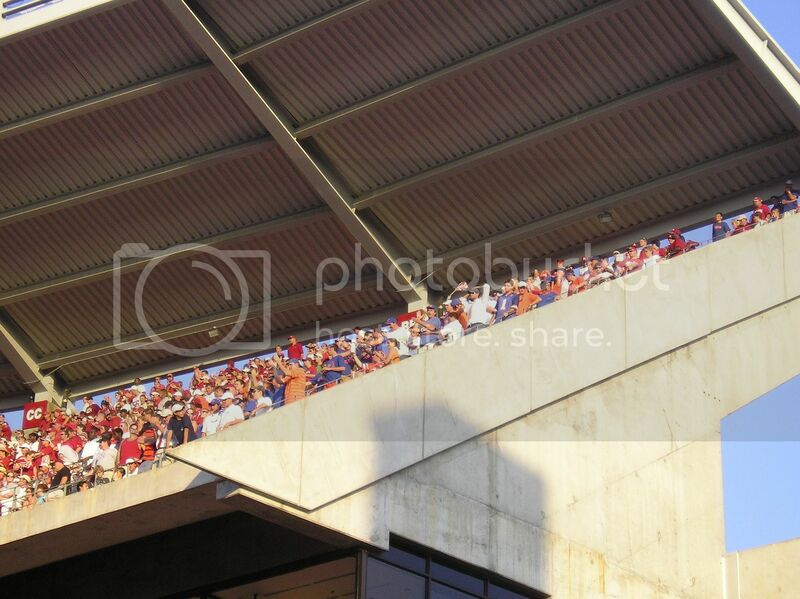 I compare the volume of crowds to that game, and only a few times have our fans gotten to that level. I compare my feelings leaving a game to that game. I hope I never have to feel as desolate as I did when I watched Tyrone being carted off the field, knowing that his great talent would never play again. See the hateful choppers? I'm glad I snapped this pic all those years ago. Who knew I'd need it for this! 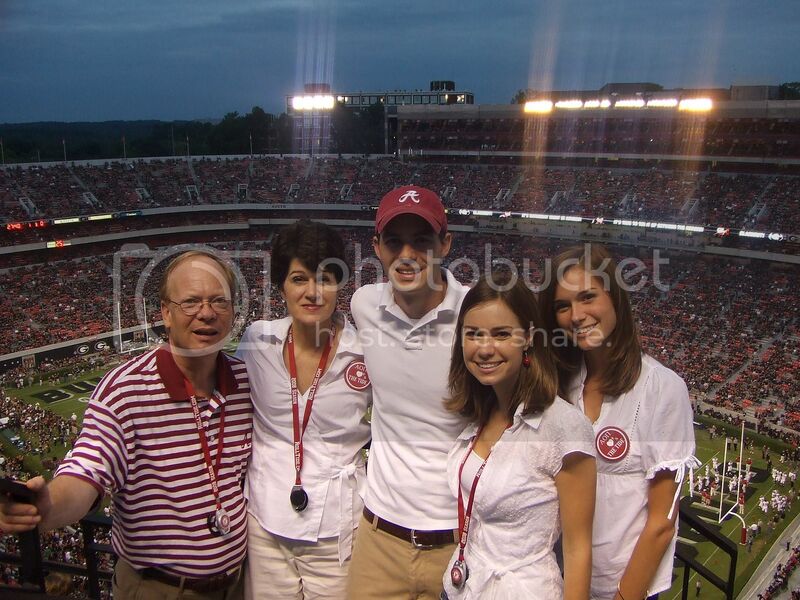 This was my first experience in Athens, GA, and man was it a doozie. 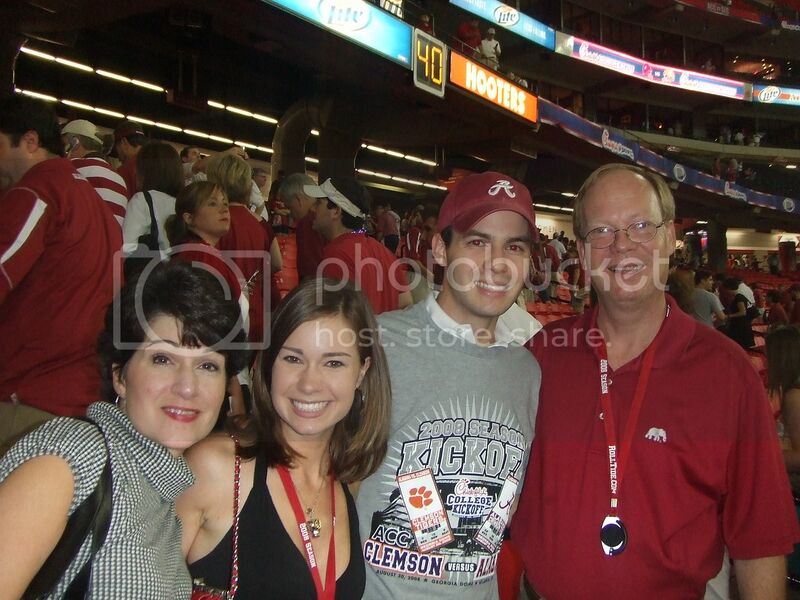 My family went to the game together, all 5 of us (this was the season before Forrest and I married). I was a 3L in law school, my sister was a freshman in college, and my brother was a senior at Georgia Tech. We played UGA on a rotation so our team hadn't been to Athens in quite a while. That was Nick Saban's second year coaching, and we were undefeated. Georgia had decided to make this game their "black out game", meaning the team and all the fans wore black. They had much success doing this the year before against Auburn, and the hype was definitely behind Georgia. We spent an interesting day wandering around Athens. My parents were cussed at (seriously, some guy got in my mom's face and said "I wish you Bama fans would jump up my a$$ and die"--to my MOM!) and some friends of us had bottles thrown at them. 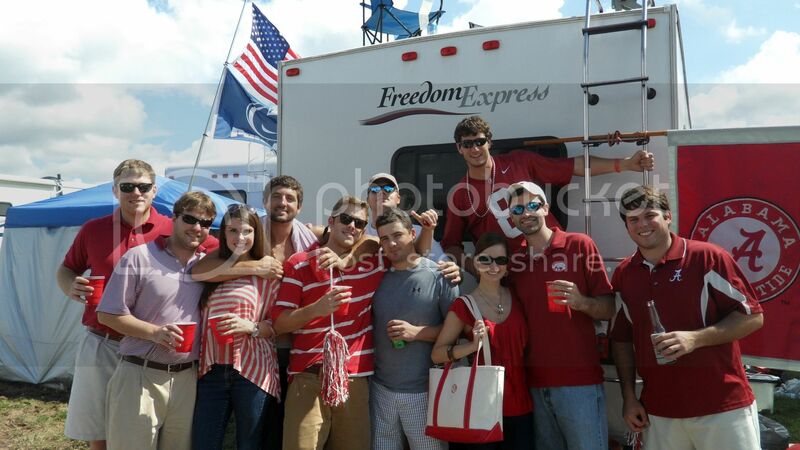 We even were given the wrong directions twice by 2 separate groups of UGA fans. We could totally feel the hostility and honestly, we were a little nervous. The stadium was loud, but not for long. Our team was up by 3 touchdowns in no time. Now, we let UGA get back those touch downs, but we ended up winning handily. 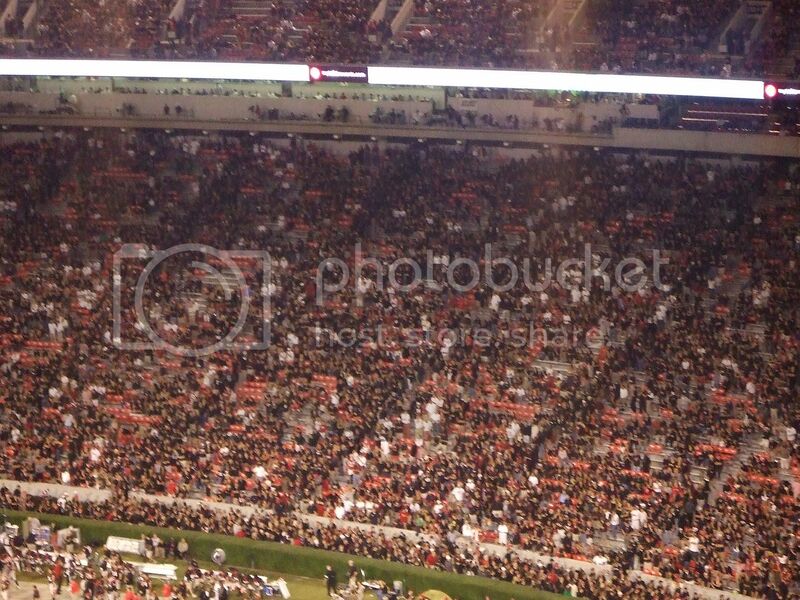 The stadium looked like it was bleeding black as the UGA fans left, totally dejected. Their gamble didn't work this time. We were singing "I said it's great, to be, from ALABAMA" all the way down the ramp from the upper deck. When we got to the stadium gates, however, my dad looked at us and told us we were not to say anything, cheer, make faces, etc at any Georgia people. We could still feel the hostility in the air and dad said he was just too old to be getting into fights for us at this point in his life. We quietly walked to the car. When we were nearly there, we saw this sad little UGA guy, painted black from the waist up, with a red O on his chest. As we passed him my sister turned around and screamed "I bet you are feeling stupid now!!". I swear, I thought my dad was going to hit her. Luckily, the guy kept walking. We actually ended up walking the rest of the way with a group of the players' families (I met Javier Arenas' mom--too sweet) so we felt much safer. We learned that year that it doesn't matter what you wear, the Tide really doesn't care. 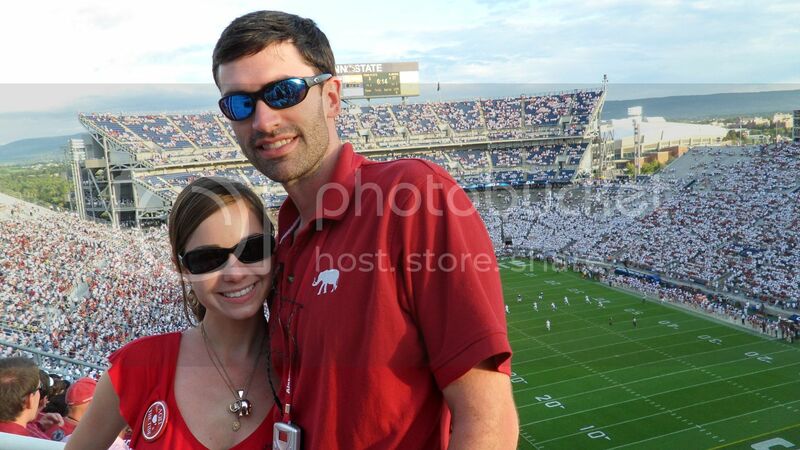 Sweet family--notice we are wearing white to "white out" the black out. Notice the black in the aisles. I should have been studying for my last law school finals, but instead, Forrest and I drove to Baton Rouge (yes, there and back in a day--that's 10+hrs in the car) for the LSU game. They had beaten us so many years in a row that it wasn't funny. This was Nick Saban's first year to go back to LSU as the Bama coach and there had been lots of drama about it all week long. Someone hung and burned Nick in effigy, people threw things at the team bus when they got into town, etc. I had never been to Baton Rouge and was really excited. 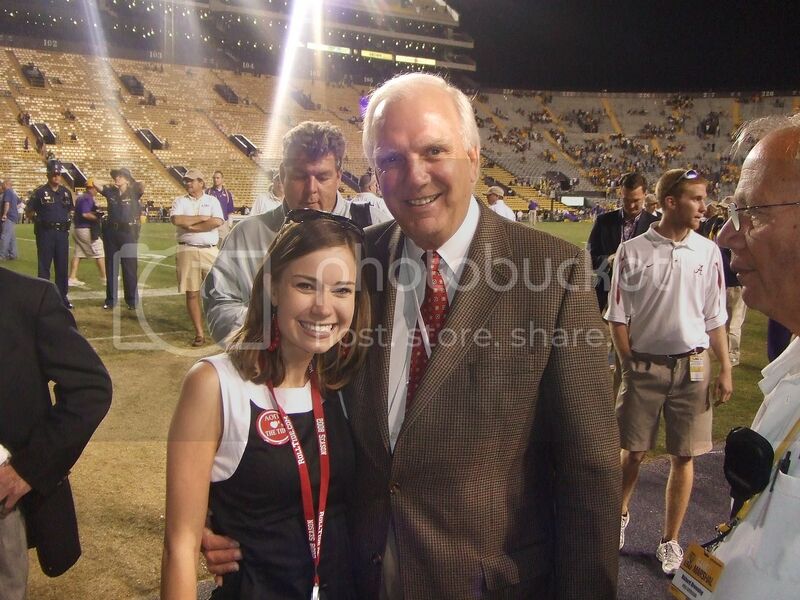 Now, I didn't care for the random LSU people getting in my face and screaming "TIGER BAIT" but hey, I'm a fan, I get it. Our tickets were on the first row, which is field level in their stadium. I couldn't see anything but it was amazing to be that close to the action! Right at the end of the game, we were going to win if our kicker made an easy field goal (it could have been an extra point but I'm thinking field goal). We walked down to the uprights to stand under it as the ball came through, which was dumb because we were in front of lots of LSU fans who were really upset at this point. 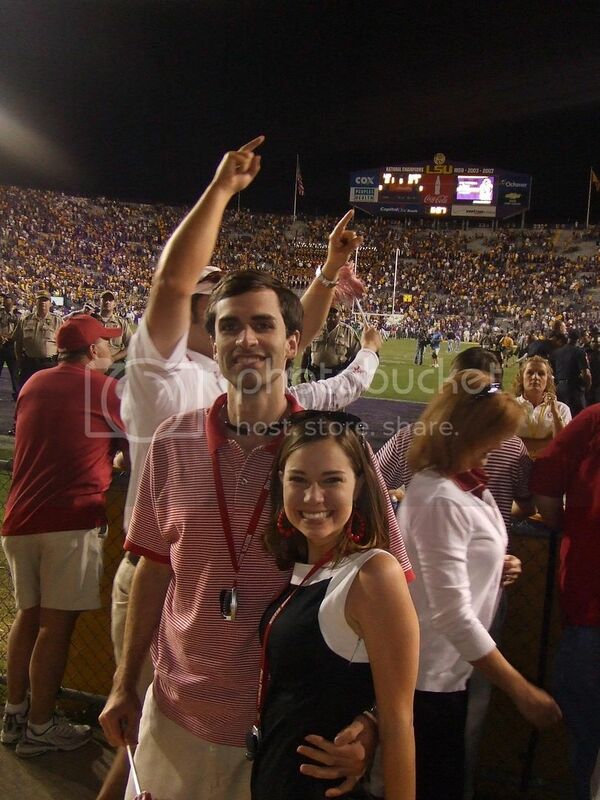 When the kicker missed, an enraged yet elated LSU man literally PICKED me up and flung me to the side. I'm not lying here. PICKED ME UP! I was stunned and looking at Forrest like "Um, are you going to do something???" Instead, we just started running--ain't nobody got time for a fight like that!! We went into overtime and in dramatic fashion, we won! Oh, the celebration! 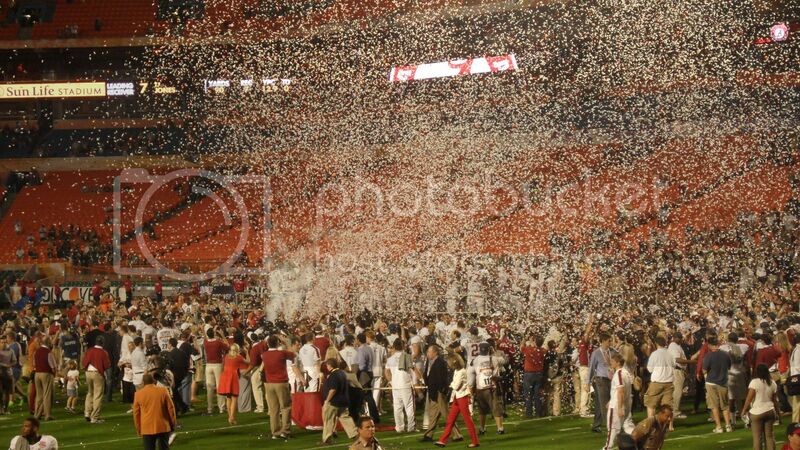 Since we were on row 1 we got to go on the field and celebrate! It was truly magical!! We ended up staying in the stadium for over and hour cheering, screaming, hugging strangers. I even got to meet some of the players when they boarded the bus! 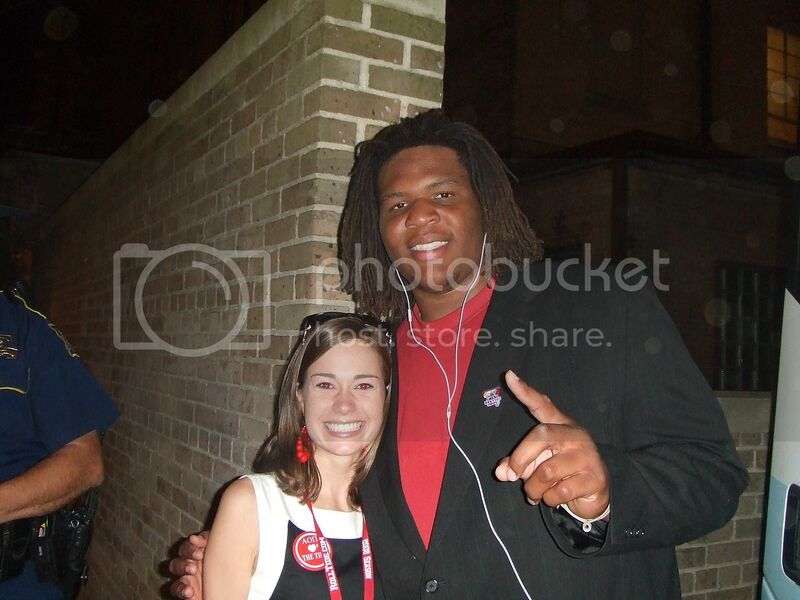 Celebrating with Terrence "Mt" Cody before he got on the bus. Notice his hands--they are the size of my head. That's why he's in the NFL and I'm writing this blog. This was one of the very first games of the season and our first real test. We just had a great season but we lost 3 games so no one was very sure of our team. We were very excited to go to PA for the game, however, win our lose. Penn State and Alabama have 2 of the most storied, traditional teams in the NCAA and it was a treat to be playing them. Happy Valley really was the happiest of places. People greeted us on the streets, they even yelled ROLL TIDE to us as we passed. 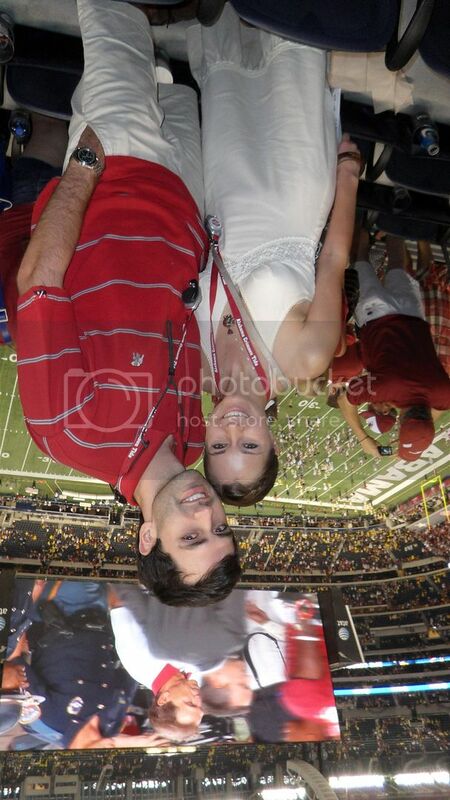 It was quite the opposite of the UGA and LSU experiences from above! You could feel the Penn State fans' passion for football radiating behind their smiles, and we knew it would be an intense game. Turns out, we were wrong. We won handily, which really did surprise us, and of course we were ecstatic. The trip itself was SO much fun, which is probably why this game stands out so much to me. It was also just before the whole Penn State scandal broke, so I'm sure we got the very best experience possible for the rivalry. A beautiful day for a win!! Tailgating fun! Bama fans know how to travel! Ok so technically this game was played in 2013 if you want to be quarrelsome. 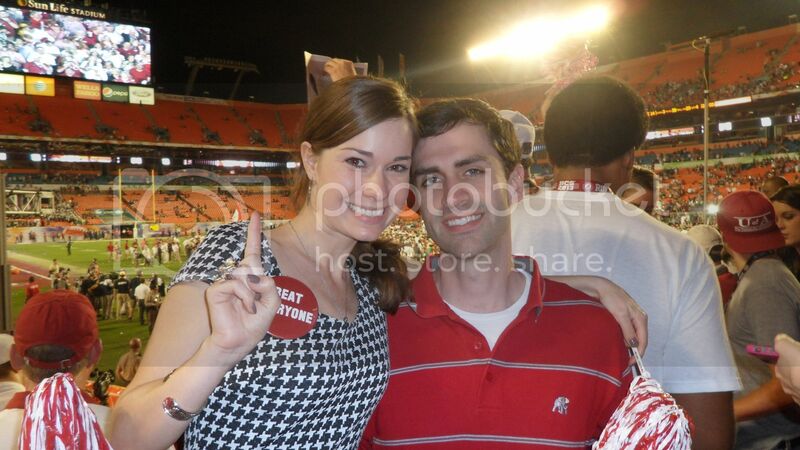 Once Bama got good and started going to National Championships regularly, I was determined to go myself. Tickets are ridiculously expensive so I didn't if that would actually happen, but I always left my options opened. This year, everything just fell into place. Someone offered us their tickets at face value. We had a hotel reservation in Miami since July, just in case (yes, I have one already for Pasadena--that's just good planning). We found terrible but super cheap flights. We made it happen. Yes, I got the stomach virus then night before the game, on my birthday, no less, but I was determined to be at that game--the fates wanted me there. With my pedialyte and box of saltines in tow, I took my seat in the stadium over an hour before kick off because I was too nervous to do anything else. Notre Dame was good. I really hadn't watched them play during the season because we were always at our games, but the hype was there. As I lay awake, sick as a dog the night before the game, ESPN kept picking them. I was so worked up by the time I got in the stadium I didn't know if I was sick or just jittery anymore. Notre Dame was loud--I felt like our fans were complacent--been there, done that--twice. I just knew that there was no way we'd win 2 in a row, and we would have spent all that money for nothing, even though it wasn't as much as it could have been. Well folks, we all know I was wrong. Up by 1 touchdown, then 2, then 3. It just kept going. My jitters subsided, I sat the majority of the game (which was good since I hadn't eaten in over a day), and we sailed into a gigantic victory. Nothing can top that! 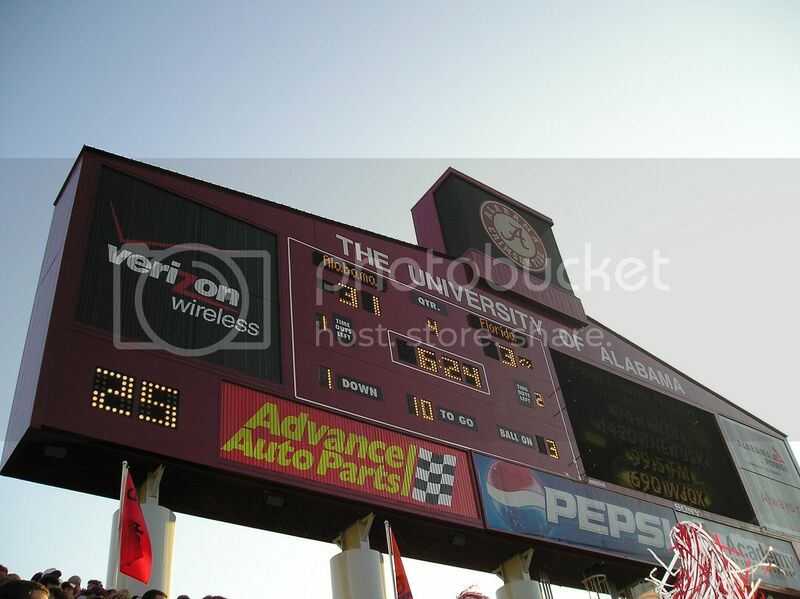 This was the first game of Nick Saban's second season. We had a pretty embarrassing season the year before and I honestly felt like we would lose this game. Clemson was ranked something like 9 and we were 25. I really just went because I was a student and got cheap tickets, plus, it was played in the Georgia Dome so I figured it would be a fun experience. It was. Our team came out like steam rollers--methodically marching down the field, driving it down the Tigers' throats. ROLL TIDE!! We're back!! Forrest and I were determined to make it for Dallas for the season opener last year. It was one thing to play Michigan, and it was quite another to be playing them in Dallas Cowboys Stadium! I remember walking around thinking "aww, these Michigan people really think they are going to win!". I was super cocky because we had just won a National Championship that no one thought we could win, but in reality, I knew that Michigan was a good team and had amazing players and we needed to be on our toes. We were. Minus the drunk girl that had a coughing fit and ended up spitting pickle all over Forrest, it was a successful game! Happy weekend! 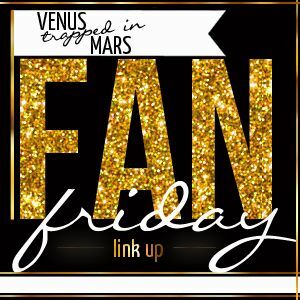 Are you a football fan? Are you gearing up for the season? Were you at any of these games? Love the picture of you and Cody. Roll Tide! Woo hoo!!! Roll Tide! This was a great trip down memory lane for me too. But But But.... what about the Third Saturday in October?? ?